There’s just something about trees that inspire and create strong feelings towards these long-lived plants that give us shade, beauty and a sense of place. So, when strange things start showing up on our trees, the alarms start to sound. Every year folks contact me concerning several different types of trees, and even shrubs, all with similar symptoms. See if you have seen this around your place. Initially, you might think your tree has borers. 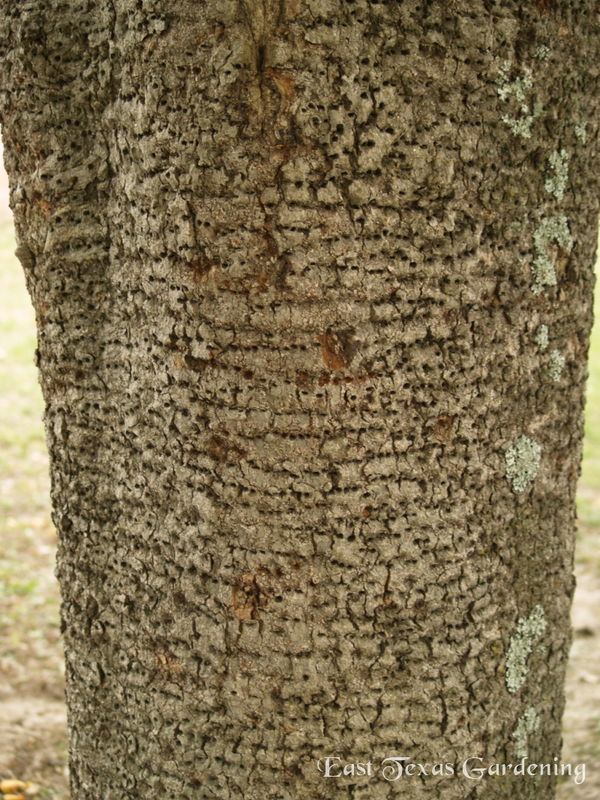 Small holes, not too deep, in parallel lines ringing the trunk or large limb of a tree. Sometimes there are lots and lots of these holes. If you probe the holes, they don’t go anywhere – just shallow holes, all in a line. 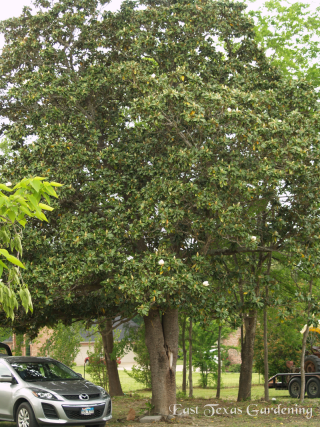 This southern magnolia tree on the left (click on the image for a large view) is a dramatic example of this type of symptom. So, you start thinking, “What could be doing this”? Borers are usually the first thought. Then, maybe a really bored neighborhood kid with a big nail and hammer. Nah, too many holes. Some sort of critter?? Maybe yes! Well, the culprit is a bird. Specifically, a yellow-bellied sapsucker. Sapsuckers are in the woodpecker family, and the repeated patterns of shallow holes, vertical or horizontal, are the key to matching the culprit with the crime. In contrast, borer holes occur randomly, never in a pattern, and typically go deeper into the wood as the larvae feeds on the interior of the tree. Like all woodpeckers, sapsuckers are clinging birds, and they are drilling these holes to produce a sap flow on which they feed. They also feed on insects which might be attracted to the sap in these shallow holes. And although they feed on insects under loose bark, they do not deeply drill into the trees seeking borers like other members of the woodpecker family. I have seen this damage on all sorts of trees, including fruit trees, oaks, elms, maples and magnolias. The magnolia tree trunk must be a season favorite for many, many years, because the about 20 + vertical feet of trunk and branches have been drilled. 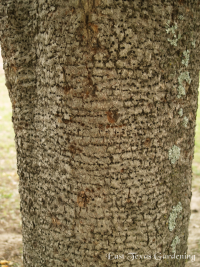 It seems like sapsuckers become habituated to certain favorite trees, and return year after year, often drilling several feet of trunk area. Although their injury may not directly kill the tree, the holes remain visible for many years, and large numbers of holes could possibly weaken a tree or branch and even eventually cause mortality if continued feeding occurs over a longer period of time of many years. If they just got started on a tree, then it may be easier to deter them than if the tree has been drilled for several years. As you know, habits are hard to break, even for birds! If the damage is fresh, then you can try to discourage the bird from coming back. You might try wrapping the area with burlap or hardware cloth to prevent access to the trunk, though you should not leave the burlap up during the summer. According to Texas Parks & Wildlife, sapsuckers are migratory and only reside in our area during the winter and early spring. Peterson's Field Guide Birds of Texas says they arrive in October and leave in April, heading north to breed. This is the same magnolia tree, and you can see it has a good general appearance, despite the thousands of holes drilled in the trunk and a damaged major limb. And, this tree is not in an irrigated yard, so tree seems to be holding up quite well. You might also try scare tactics like rubber snakes or an owl, streamers of foil, or other scare devices, though I don't have much confidence in those tactics actually working in the long run. Sapsuckers are federally protected under the Migratory Bird Treaty Act, therefore do not attempt to trap or injure/kill these birds..